Each morning before I leave for work, I aim to do one more thing. "One more thing" always starts so simply. While in the hallway I find a single sock belonging to one of my children. I carry the sock up the steps, wondering why socks are never found in pairs, why they prefer to exist in balled-up, isolated states, and load my arms with other odds-and-ends left behind on the stairs as I make my ascent. Once I distribute the items from the stairs to the appropriate bedrooms, I start a load of laundry because, if I know anything about socks, it's that they're never balled-up on a hallway floor when they're clean. After loading the washing machine, I walk down the hallway again, this time noticing that one of the kids left the bathroom light on and a glob of semi-gelatinous toothpaste is hardening in the sink. I wipe up the toothpaste, perhaps touch up the mirror with Windex, and head downstairs to go to work, but not until I pack my lunch from last night's leftovers, store the remaining leftovers in a Ziploc freezer bag for another meal (such foresight! I'm so smart! ), throw away the lettuce that had wilted behind the leftovers, and then take out the trash. Don't let the phrase deceive you. "One more thing" rarely is one more thing. It multiples and spreads, tentacle-like, leading us to different rooms, different messes, and different to-do items that hadn't even crossed our radar. My twenty "spare" minutes before work get filled to the brim, making me feel more behind than ahead. And that grocery list I jotted down after my initial morning task of putting away the dishes? There's a 50-50 chance it never made it into my work bag, that I'll find it on top of the washing machine when I transfer the clothes into the dryer after dinner. Now, I'm all for hustling and making the most of my time. But sometimes one more thing can -- and should -- wait. Sometimes it's enough to do just one thing -- like getting ready for work -- and not tack one "more" thing to it. Sometimes it's smart to show restraint, acknowledge that rest of the work will be there when we return, leave it as it is, and learn how to be at peace with what we got done, even if it wasn't all of what needs to get done. To put our heads on our pillows at night and trust God that tomorrow can be a safe space for the overflow of what couldn't fit into today. We all have seasons, whether from our nature or out of necessity, when life is marked by greater intensity and hustle. But I don't want this to be my continual norm. I don't want my life to be characterized by rushing. Efficiency? Sure. Hard work? You betcha. Foresight? Yes, please. But I don't want to become a slave to always completing "one more thing." It'll be there when I return, after all. 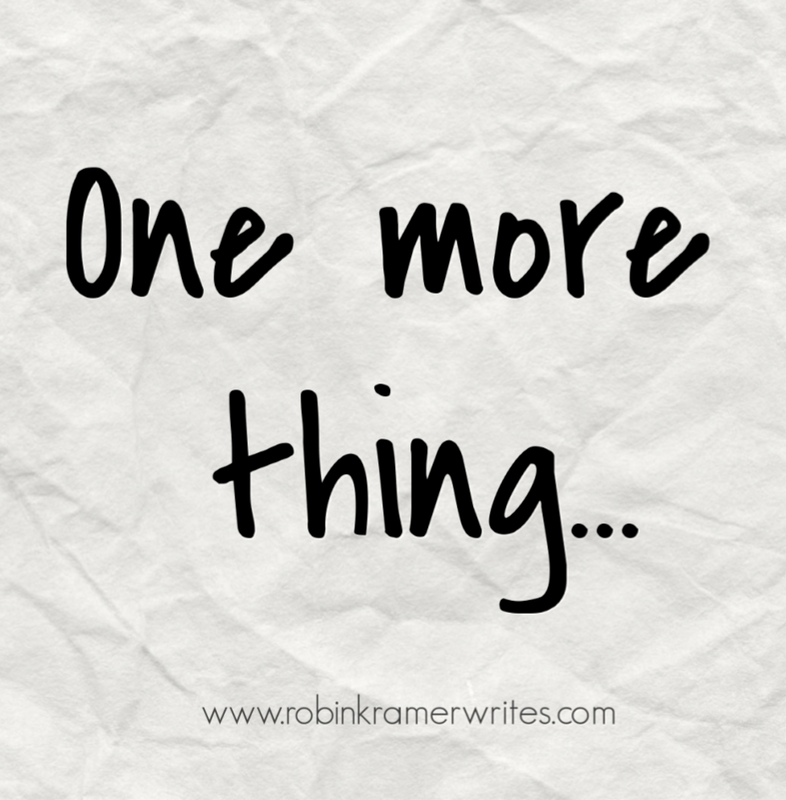 Do you ever get caught in the "one more thing" rut? Tell me about it in the comments!